Post housing crisis, mortgage underwriting is thorough, overbearing and at times non-nonsensical. Some say it borders on harassment. Gone are the days of “liar loans” and no doc loans and good riddance. However, while underwriters continue to scour every inch of your financial past, lenders are again offering 100% financing and other programs where a buyer can use gifts or grants for the downpayment and closing costs. For buyers with great credit and secure incomes but limited cash reserves, these programs may be the path to home ownership. In broad strokes, let’s review some of the options available to today’s home buyers. I say in broad strokes because each lender may have unique overlays or restrictions on the programs below. Without a doubt, the best no money down option is the VA loan. They do charge an upfront fee called a funding fee but there is no mortgage insurance and rates are usually equal to or slightly lower than conventional rates. Furthermore, they are assumable to another veteran. This may be a very important selling tool years from now when, almost certainly, rates will be higher than they are today. VA loans are available to active service members and veterans. Members of the National Guard and reservists can also qualify. Here is a link to the VA website that details the specific eligibility requirements. If you qualify for a VA loan, read no further. This is the loan for you. There is nothing better. The minimum downpayment for a FHA loan is 3.5%. However, you may receive a gift for all of the down payment. Note, that reads gift, not loan. Typically, the gift is from a relative but there are a few other sources that are acceptable. Want a little light reading? Here is a link to the HUD website that outlines gift guidelines. The specifics are on page 10 of the document. You can also ask the seller to pay up to 6% of the sales price toward closing costs. At least in Northern Virginia, that is way more than you will need so it is possible to get in for no money out of your own pocket. Several credit unions have no money down programs. There are no uniform guidelines so you will need to check with your specific credit union to see if they have no money down financing. Some programs have income limitations. Others are for first time buyers only. Make sure you qualify. In general, I have found that credit unions offer rates comparable to traditional lenders but with much lower fees. For the 100% financing programs though, the rates may be higher particularly if the loan does not have PMI. It is hard to analyze the best option but if you have any questions, always feel free to give me a call and I can guide you through a decision tree. By the way, one of the larger credit unions is Navy Federal. Folks often think NFCU is only open to active and retired service members but it casts a much wider net. Current and retired Department of Defense employees are eligible. Family members of eligible individuals can join. Even roommates of members can join. Here is link to their eligibility requirements. They do have a few different no money down options so it may be worth a look. But they are not the only great credit union out there. NASA credit union has a competitive 100% product. Call your credit union to see if they have something that would work for you. 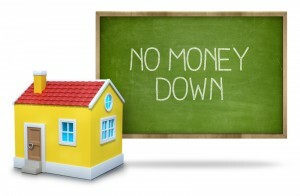 Several lenders have programs that offer grant money to cover the down payment. As with the credit unions, some have income requirements and/or are limited to first time buyers. An example of one such program is the one offered by Movement Mortgage. This has no first time buyer requirement but does have income limits. Income can not exceed $149,800. The grant, which will be forgiven after closing, can be for up to 5% of the purchase price so it works well with a 95% conventional loan. The maximum loan amount is $417,000. Call me for a referral to a Movement loan officer if you are interested. Other lenders including Freedom Bank have grant programs available. But please note that grant programs often have limited money so if you find one you like, act quickly. As of December 12, 2015, Fannie Mae is now allowing 95% loans up to $625,500 in our area. And, the 5% can now be a gift from a relative. Go to page 4 of these guidelines to read about it. The program is new and I do not know all of the ins and outs at this time so contact your loan officer for details. I hope this post helps. In today’s traditional mortgage market, there is no way to overcome bad credit or high debt to income ratios but lack of a down payment should not be a roadblock to home ownership. And note that all of the above mentioned programs have 30 year fixed rate options. A few offer longer term, safe adjustables but none of the craziness of a few years back where borrowers had rapidly increasing interest rates and negative amortization. These are very manageable loans. Call me any time to discuss your specific situation.